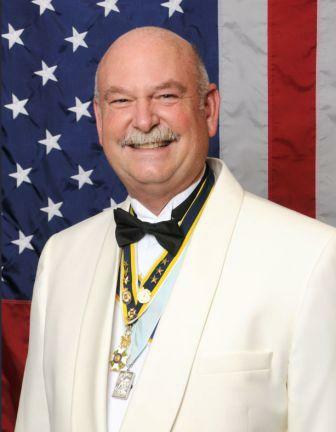 President General J. Michael Tomme, Sr.
J. Michael Tomme was elected President General of the National Society of the Sons of the American Revolution in July 2016, to serve a one-year term. John Michael “Mike” Tomme, Sr., joined the Sons of the American Revolution (SAR) in 2003. He is a Charter Member of the Marquis de Lafayette SAR Chapter in Fayetteville, GA. He has served the SAR at the local, state, and national levels. In July 2016, at the 126th SAR Congress in Boston, MA, Mike was sworn in as the 113th President General of the National Society Sons of the American Revolution. He is the third President General from Georgia. Mike is very active in the SAR and is frequently seen in his George Washington Life Guard uniform. He has traveled the nation attending numerous historic and patriotic celebrations representing the SAR Color Guard. Mike served as the SAR National Color Guard as Commander from 2012-2014. He has been recognized for his efforts and involvement in his community by the DAR. Mike has a focus on our youth of tomorrow and the youth education programs. He has been an active participant in colonial living history presentations. He has been active with the youth through his involvement in the CAR at all levels. Mike is retired from the State of Georgia, where he worked for the Department of Administrative Services in Risk Management. He has held several positions over his 34 year career. Mike is a member of several lineage societies including: Sons of the Revolution, The Society of the War of 1812 in Virginia and Georgia, Descendants of Washington’s Army at Valley Forge, First Families of Georgia, Colonial Wars, Sons and Daughters of the Pilgrims, Order of the Founders of North America 1492-1692, and Descendants of Sheriffs & Constables of Colonial & Antebellum America.